When I was a kid, cakes like this one were on our table very often. My lovely Mom used to make them. They were filled with any fruit that was in season. And during the months of winter, Mom would use just about any canned fruit she had on hand. So, whether you use plums, cherries or any kind of berries to make this sponge cake with fruit, you’ll be amazed by a very nice flavor it has and how surprisingly easy it is to prepare it. 2. Separate the eggs placing the yolks in one bowl and the whites in another. 3. Pour the sugar into the egg yolks and beat until thick and pale in color. Try your best not to eat this all. Oh my gosh, it’s so good. 4. Then add the butter and mix until fluffy. 5. Next, in a small bowl, combine the flour and baking powder. Add it to the egg-yolk mixture. Mix to combine. …until they hold stiff peaks. 7. Add the whites into the egg-yolk batter. Small lumps of egg whites in the batter are okay. 8. Spray a baking pan with cooking spray and dust it lightly with flour. 9. Scrape the batter into the prepared pan. I used a 13 x 9-inch (33 x 22 cm) baking pan. This cake will rise a lot, so if you are going for a less tall version, use a larger baking pan. 10. Spread out the batter evenly. 11. Now cut the plums into halves. Or, if you are using canned plums, drain them. 12. Evenly arrange the halved plums on top of the batter. 13. 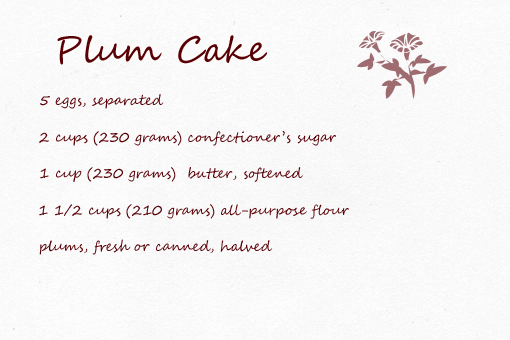 Bake at 350 °F (175 °C) for about 20 minutes or until a toothpick inserted in the center of the cake comes out clean. 14. Remove from the oven and let cool. 14. Then dust with a little confectioner’s sugar and cut into squares. And most importantly, enjoy, dear friends! These muffins are like treasure boxes. The moment you take a bite the muffin welcomes you with its moist and tender texture. After a while you’ll notice that a couple of refreshing assorted berries have come to greet you too. ‘Yum’ – that’s exactly what comes to your mind! And then, as if this wasn’t enough already, you’ll stumble upon these wonderfully rich and creamy white chocolate chunks that counterbalance the tartness of the berries in a way you’ve never even dared to dream about before. These muffins, they are amazing. I’ve noticed that for some reason the number of ingredients in my recipes rarely exceeds ten. 1. To make your own ‘treasure box’ muffins you’ll need two bowls. One bowl for the ‘wet’ ingredients and the other one for the ‘dry’ ones. Then you just combine the two, bake it and that’s it. No, no, no, just kidding – don’t you expect me to leave that quickly. I’m here to reveal the whole story in every specific detail. Otherwise my brain would break. So (and this really is the step number one), in a bowl pour all the wet ingredients – the lemon juice, oil, milk and egg. 2. Whisk them to combine. 3. Then grab the white chocolate. And chop it roughly into chunks. Of course, you can also use store-bought chunks or even chips. 4. Place the dry ingredients (the flour, baking powder, salt, sugar and chocolate chunks) into the second bowl. Set about half a cup of chunks aside for decorating. 6. Now pour the wet mixture into the dry one. 7. And stir -and this is important when it comes to muffins – just until it combines. Small lumps are perfectly all right. Overmixing a muffin batter might result in tough muffins. 8. Finally, add the berries. If you decide to use frozen berries, don’t let them thaw before baking. That way they won’t bleed into the batter and the batter will remain yellow(ish). Which is exactly what I didn’t do. 9. Gently, fold in the berries and admire the beauty you’ve created. Yes, I see a lot of beauty in batters. Yes, I am feeling all right. 10. Line the muffin tin with paper liners. If you don’t want to use papers, then just oil the tins with some vegetable oil. 11. Using a spoon, fill each cup full of batter and sprinkle a few chocolate chunks over the top. The extreme amount of batter per cup might surprise you, but that way you’ll achieve those nice domed tops more easily. … or until the tops are golden brown and a toothpick inserted in the center of a muffin comes out clean. 13. Remove from the oven, transfer to a wire rack and let cool for about 5 minutes before removing from pan. Here it is – standing proud in all its irresistible deliciousness. This recipe makes 11 large muffins. Recently you’ve been craving something yummy but you just didn’t know precisely what it was. And I am here to tell you exactly what it is. That’s my purpose on this planet, actually. What you’ve been craving recently is this wonderful, delicious, scrumptious and luscious lemon delicacy. Call me a witch if you want to…but I just know it. These are the ingredients that you’ll need if mere looking at these pictures isn’t enough for you. This treat isn’t just wonderful in taste, it is also very interesting in structure – which only adds to its WOW factor. Since half of it is baked and the other half is cooked you get two surprises in one dish. Come and have a look, I’ll show you what I mean. 1. To prepare you own Lemon Delight first place the softened butter and the sugar (1/2 cup – 100 grams) into a medium bowl. 2. 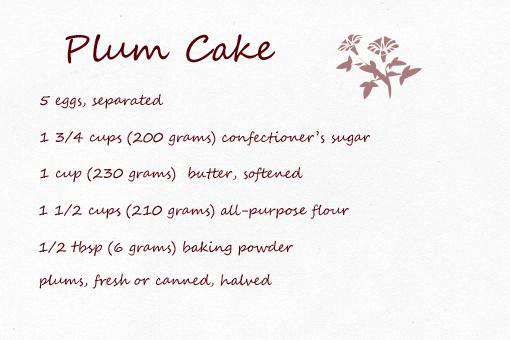 Mix it with your hand mixer until light and fluffy. 4. …and mix again until smooth. 5. Add the flour and the baking powder and give it another mix, just until combined and well incorporated. It might have something to do with the fact that I am using home eggs here – fresh from my Grandma. They are so much richer in color. 6. Then grab a lemon and juice it – any way you like. If you are a Xena woman like me, you can squeeze it with your bare hand (okay, I am not that much of a Xena woman, I just don’t have the juicer here with me). That might actually be the reason why I am not showing the picture of me squeezing the lemon (oh, that was a stormy fight). But what I am showing here is a little trick that helps a lot…if you’d like to make things easier then just roll the lemon on the countertop (before you slice it). It will help to break down some of the fibers and the juice will flow more freely when you cut it. 7. Then, when the fight is over, pour the milk and the lemon juice into the batter and stir to combine. 8. In a separate bowl, whisk the egg whites until firm. 9. Add the egg whites to the batter and, using a rubber spatula, fold together gently. 10. Spray you ramekins with some vegetable oil and fill them with the batter. Since I used 1 cup (250 ml) dishes, there was just enough batter to fill three. 11. Place the ramekins into a deeper baking pan and gently pour boiling water to come halfway up the sides of the ramekins. 12. Bake at 356 degrees F (180 degrees C) for about 40 minutes or until golden brown. 13. Remove from the oven and dust the top with some confectioner’s sugar. So now you know what I meant when I said that half of this dessert is baked and the other half is cooked. You’ll be amazed by how this process results in the dessert’s structure – the top half looks like a cake and the bottom half has a structure of custard. Okay, it seems that I am done here. And now only tomatoes for me for the next seven days. To some of you – who have been raised on typical American pancakes – these might sound and look quite exotic. Yeah, they are those delicate things that those weird, delicate Europeans eat. … With their delicate fingers. On the other hand, those of you who come from Europe, might perceive crepes as something very similar to oxygen you breathe. I guess they are this much common and usual all over the old continent. And you, dear Europeans, look at the American chubby pancakes with kinda perplexed look in your eyes. Well, now that we are clear about the difference between Europe and America (which definitely lies in the preferred thickness of pancakes) we can have a look at the origin of the word ‘crêpe’. That, in fact, comes from Latin ‘crispa’, meaning ‘curled’. I guess the one who has invented this dish must have had an excellent sense for cuteness – because these beauties, with their adorable shape and their scrumptious taste, represent pure, heart-touching cuteness to me. Do you eat pancakes or crepes? This is what you are going to need in order to prepare you own delicious crepes. The ingredients are very simple and easy to find in everyone’s pantry. 1. The first step is awesome, I think. You just place the flour, eggs, milk, water, sugar and salt into a larger bowl and whisk it till it’s smooth. You don’t even have to pay attention to what comes first. Initially, the batter will look rather lumpy – which means some more mixing is needed. Sooner or later there comes the point when the batter becomes perfectly smooth. 2. Pour one tablespoon of the vegetable oil into a medium sized frying pan (I used 7-inch – 18 cm pan). 3. Heat the pan over medium heat – we definitely don’t need too strong heat here. 4. Pour or scoop the batter onto the pan, using approximately 1/4 cup (60 ml) for each crepe. 5. Tilt the pan with a circular motion so that the batter coats the surface evenly. 6. Cook the crepe for about 30 – 40 seconds, until the bottom is light brown. 8. … turn and cook the other side. 9. Place the crepes on a separate plate and let cool a little – just until they can be handled with your hands. 11. … and roll it up. Sweet crepes can be garnished with fresh fruit and whipped cream. Let me introduce my most favorite cookies to you – if these can be called cookies. I’d rather call them ‘wondrous sensations of supernatural origin’. That’s what I’d call them. Oh, and there’s a confession I have to make regarding me and my relation to these gems. Frankly, I have been addicted to meringues for about 29 years. Okay, not exactly 29, I was probably fed milk for the first year of my life. So let’s say – for 28 years. My love for these beauties was so strong that I learned how to make them early in my life. It just became too life-threatening to rely on a store and whether they had them or not. Well, I guess this all pretty much explains how gorgeous they are. I recommend using very fresh eggs. 1. Separate egg yolks from whites. 2. Pour 1 1/2 cup (170 grams) sugar into the bowl with the egg whites. 3. Mix with a whisk until incorporated. 4. Then pour a little water into a medium pot. Place the pot on a stove, heat it up and let simmer – because we need steam now. 5. Place the bowl with the egg whites over the pot with simmering water and using a hand mixer, whisk the mixture on slow speed for about 15 minutes. This is what we are going for – soft peaks. Now, try to find a piping tip that resembles this one. 7. Fill the piping bag (or whatever you use for piping) with the egg-white mixture. 8. Line a baking sheet with parchment paper. 9. And start piping. I have achieved this shape by creating 4 small heaps very close to each other – so that they are touching each other. 10. Preheat the oven to (only!) 266 F (130 C). 11. Place the sheet into the oven, bake at 266 F (130 C) for 10 minutes, then reduce the temperature to 212 F (100 C) and bake for 50 minutes. 12. Rotate the sheet halfway through the baking period. 13. Meanwhile, mix the egg yolks with the rest of the sugar. 14. Using a hand mixer again, whisk them over the pot of simmering water for about 15 minutes. 16. Add the cocoa and coffee and mix just until incorporated. 17. Let cool completely, then add the butter and mix again until well combined and smooth. 18. Remove the cookie shells from the oven and let cool. 19. Fill the piping bag with the coffee filling and – using the same piping tip as for the shells – pipe the mixture onto a shell. 20. Now place another shell onto the filling – both shells have flat sides facing down. Without sugar or a cookie what are we?